For other photographs see the introduction to the What was new page. 1959-62 - BA Honours Degree, Cambridge University: Modern History Pt 1; Social Anthropology Pt 2. 1963-4 - H M Fletcher, Cecil Court, WC2. Antiquarian bookseller's assistant. 1964-8 - Francis Edwards Ltd, Marylebone High Street, Wl. Assistant in the Map Department [to R.V. Tooley], producing sale catalogues and cartobibliographical monographs [Map Collectors' Series]. 1969-84 - Weinreb & Douwma Ltd (after 1978, Robert Douwma Prints & Maps Ltd), formerly Great Russell Street, WC1, latterly Henrietta St, WC2. A Director, in charge of the map side of the business, responsible for compiling and editing sixteen catalogues. Comissão Nacional para as Comemorações dos Descobrimentos Portugueses: English-language representative, 1989-? *** brokered the agreement with Taylor & Francis (Routledge Journals) in December 2002 for them to take financial responsibility for publication and distribution in both print form and online. International Federation of Library Associations: Section Member and Financial Officer, Geography and Map Libraries Section, Special Libraries Division, 1989-?? Meridian, a journal of the Map and Geography Round Table of the American Library Association: Consulting Editor, 1988-?? Royal Geographical Society: Fellow, 1970-[2004? ]; Member, Library and Maps Committee [later Information Resources Committee], 1978-2001 [with a break c.1984-6] ; Council Member, 1991-4. Royal Historical Society, 'Historians' guide to early British maps': Executive Committee Member, 1992-4. Society for the History of Discoveries: Council Member 1988-90, 1995-97? Also member of the British Cartographic Society and (formerly) the Charles Close Society. *** → 'Map History / History of Cartography' - devised and maintains the gateway site for the subject (1997- ), originally mounted on the Institute of Historical Research's server IHR-Info (later 'History'). [This had grown out of the 'What's What in the History of Cartography' - see under Articles 1995]. In 2000, 'Map History' was accepted into the World Wide Web - Virtual Library (WWW-VL). In 2003 it moved to the server of ammonet.com. For a history of the site, links to the archived pages on the Wayback Machine, and reviews, see What Was New. MapHist list. 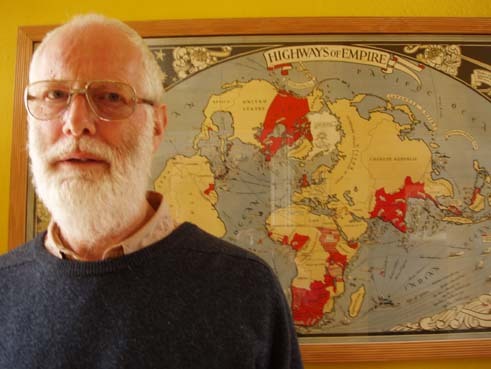 One of the founders in 1993, see Ed Dahl's account, The Hist of MapHist: A Chronicle of the Origins of the Map History Discussion List, 1993-94. * Hon. Secretary of the J B Harley Research Fellowships in the History of Cartography, 1992-2004. Trustee until 2006. Consultant to Granada Television on 'The Shape of the World', a six-part series broadcast in 1991. Consultant to BBC TV on 'Tales from the Map Room', a six-part series broadcast in 1993. * Organiser of the Mapping Exhibition at the 15th International Cartographic Association conference 'Mapping the Nations' (Bournemouth, 1991). ** Overall responsibility for the move of 4.2 million maps (including 67,000 volumes) from the British Museum to the St Pancras building, with the reading closed for just one month. *** Devised and directed the project to retroconvert the 200,000 records in the BL's map catalogues (1989-99), and wrote the Help file. ** Concluded negotiations, over many years, for the entire Ordnance Survey National Topographic Database (equivalent to 230,000 published sheets) to be deposited annually (2001?). *** 'Indexes to material of cartographic interest in the Department of Manuscripts and to manuscript cartographic items elsewhere in the British Library' (1992) [unpublished printouts from a 16,000-item database, available in the British Library, with a small later supplement]. * Helped devise and co-ordinated Rodney Shirley's 'Atlas Collation Project' (1989-2002), published in two volumes in 2004. This provides the BL with c. 60,000 [?] records for individual maps in 3,200 pre-1800 atlases. ** Acquired the 'Mercator Atlas of Europe', with a lottery grant of £500,000. ** Involved in the purchase (initially as adviser) of a number of atlases and maps - see Section 5 ('Notable Acquisitions') of the Imago Mundi 'Chronicle' (1984-2001), where the more significant items are listed, including MS material acquired for the Department of Manuscripts. * Devised and organised the 1989 'What use is a map?' exhibition in the British Museum building, and played a significant role in the 2001 'Lie of the Land: the Secret Life of Maps' exhibition in the St Pancras building. * Helen Wallis Fellowship at the British Library - instigator, organiser and member of the Selection Committee (1997-2001). * Devised and contributed significantly to the 'Public Service Guide', a compendium of information to help in answering Reading Room enquiries. Worked to achieve 'interavailability', allowing cartographic material from different BL departments to be compared, side-by-side, in the Maps Reading Room. Abandoned the geographical pressmarking classification system (in use since c. 1850), which had necessitated complicated interfiling. Also abandoned, and rectified, the storage of dissected maps in solander boxes. * A copper plate containing an abandoned early form of Christopher Saxton's map of England and Wales of c. 1583 (now in the British Library) - see under Articles 1979. * 1981. Early Maps (New York, Abbeville Press - with later printings in 1983 and 1999). [Also Dutch edition: Hoogtepunten uit de wereld van de cartografie, translated by H A M van der Heyden. Amsterdam, Becht]. *** 1987. The earliest printed maps, 1472-1500 (British Library Publications and University of California Press). No. 21. The printed maps of Barbados (1965). No. 36. Japan: European printed maps to 1800 (1967). No. 46. Claes Jansz. Visscher: a hundred maps described (1968). No. 26. The maps of South-West France (1966). No. 34. Notes and Addenda (1967). No. 42. The printed maps of Jamaica up to 1825 by Capt. Kit S. Kapp (1968). 1970. 'Moon Maiden for the Sun King', Texas Quarterly 13, pp. 8-13. [On the 1679 moon map by Jean Dominique Cassini]. 1971. Paper on the large Blaeu globes, distributed at the 4th International Conference on the History of Cartography, Edinburgh 21-24 September - see 1976. * 1975. 'Martin Llewellyn's atlas of the East (c.1598)', paper distributed at the 6th International Conference on the History of Cartography, Greenwich 7-11 September [see under 2006 for a revised online version]. 1975. 'Atlas pioneer: first sea atlas of the East drawn by an Englishman', Geographical Magazine 48, pp. 162-7 [see under 2006 for a revised online version]. ** 1976. 'A descriptive census of Willem Blaeu's sixty-eight centimetre globes', Imago Mundi 28, pp. 21-50. [Available online via JSTOR subscription (in the 'Arts & Sciences Complement')]. 1977. Paper on the Etzlaub Rom Weg map, distributed at the 7th International Conference on the History of Cartography, Washington, D.C. 7-11 August - see 1978. 1978. 'The Anglo-French struggle for India in the eighteenth century', The Map Collector 5, pp. 30-5. 1978. ‘Moment in French history', Geographical Magazine 51, pp. 223-9. ** 1978. 'The woodcut map considered as a physical object: a new look at Erhard Etzlaub's Rom Weg map of c.1500, Imago Mundi 30, pp. 79-91 [and 'Postscript', Imago Mundi 33, p. 71]. [Available online via JSTOR subscription (in the 'Arts & Sciences Complement')]. * 1979. 'A false start on Christopher Saxton's wall-map of 1583', The Map Collector 8, pp. 27-29 [On a copper plate, now in the British Library]. 1980. 'New light on the Jansson-Visscher maps of New England' in: R.V. Tooley The Mapping of America (Holland Press Cartographica 2, 1980), pp. 279-94] (an updated reissue of Map Collectors' Circle No. 24 (1965)). 1982. 'Pierre Mortier's world map of about 1700', The Map Collector 18, pp. 50-2. 1983. ' "At the time of writing ... " - a brief account of chronograms', The Map Collector 22, pp. 48-9 [and letter in issue 26, p. 45]. See the expanded online version (2008) here. 1984. ‘Raleigh and Roanoke: the first English Colony in America, 1584-1590' - leaflet for the British Library exhibition. 1984. 'Bibliographical notes on nineteenth century British Admiralty charts', The Map Collector 26, pp. 9-14 [with Andrew David (this has been reissued on the Kunstpedia site)]. 1985. 'One map, two purposes: Willem Blaeu's "West Indische paskaart" of 1630', The Map Collector 30, pp. 36-8 [this has been reissued on the Kunstpedia site]. 1985. 'A Cook mystery solved', The Map Collector 32, p. 37. 1985. 'Cartochronology, or helpful hints on how to get a date', The Map Collector 33, pp.52-4 [this has been reissued on the Kunstpedia site]. 1985. Bibliography of G R Crone: selected writings on the history of cartography in Imago Mundi 37, pp. 82-3; full version in Transactions of the Institute of British Geographers. 1986. 'Visscher's first world map: a British Library acquisition', International Map Collectors' Society - Map Fair & Exhibition catalogue, pp. 30-2. * '1984' [i.e. 1986]. 'Cyprus and the medieval portolan charts', Kupriakai Spoudai 48, pp. 47-66. 1986. Biographical notes on Aaron and John Arrowsmith, George Lily and Bradock Mead in the Lexikon zur Geschichte der Kartographie (Vienna: Erik Arnberger). ** 1986. 'Census of pre-sixteenth-century portolan charts', Imago Mundi 38, pp. 67-94. [Available online via JSTOR subscription (in the 'Arts & Sciences Complement')]. 1986. 'Recent Acquisitions: Selected acquisitions, mainly from the period 1979-1985 - Map Library', British Library Journal 12, pp. 184-96. 1988. 'A whale of a piece' [on the Deutecum Nova Francia map], The Map Collector 41, pp. 12-13. 1989. The map collections of The British Library. London. British Library. 1989. What use is a map? London: British Library. [Contribution to exhibition catalogue]. * 1990. Ordnance Surveyors' Drawings 1789-c.1840. Reading: Research Publications. [Summary listing and indexes, to a work by Y Hodson]. 1990. 'The history of cartography'. In: C R Perkins & R B Parry (ed.) Information sources in cartography. London: Bowker-Saur, pp. 75-125 [with others]. 1991. 'The British Library's map collections and the national topographic memory', Cartographic Journal 28, pp. 27-9. 1993. Retroconversion of The British Library's map catalogues: the art of the possible, Liber Quarterly 3, pp.1-6. 1993. 'Laying bare the secrets of the British Library's map collections', The Map Collector 62, pp.38-40. 1993. ‘Cutting costs’, ‘Traditional warnings and coastal dangers’, ‘For those in peril on the sea’, ‘Finding a safe haven when at sea’, in: P. Barber & C. Board (eds) Tales from the Map Room: fact and fiction about maps and their makers. London: BBC Books, pp.34-5, 162-5, 168-9. 1994. Cyprus: the reliability of early maps. Nicosia: Bank of Cyprus Cultural Foundation. 1994. ‘The Future History of our Landscape’. Ordnance Survey Information Paper 12/1994 [reprinted in Sheetlines 41 (1994) 6-21]. * 1994. ‘The copyright libraries and digital archiving: the analogue option’. In: C. Board & P. Lawrence (eds) Recording our changing landscape. London: Royal Society and British Academy, pp.57-60. 1994. ‘Conversion of the British Library’s Map Catalogue: the keys to success’ [NB. pdf file], INSPEL: Official Organ of the IFLA Division of Special Libraries 28, 1, pp.67-72 [also French version pp.73-79]. 1994. (with P. Barber). ‘Map collecting’ and ‘Road maps’, in: H.M. Wallis & A. McConnell (eds) The Historians’ Guide to Early British Maps. London: Royal Historical Society (pp.53-5, 89-91). 1995. ‘The Globe my World’: tributes to Dr Helen Wallis OBE 1924-1995 (ed. with Sarah Tyacke). 1995. [unsigned] ‘What’s what in the history of cartography’, in: M.A. Lowenthal (ed.) Who’s Who in the History of Cartography: the international guide to the subject (D8). Tring: Map Collector Publications, pp. 9-34. ** 1996. ‘Egerton MS 1513: a remarkable display of cartographical invention’, Imago Mundi 48, pp.93-102. [Available online via JSTOR subscription (in the 'Arts & Sciences Complement')]. ** 1996. ‘R.H. Major and the British Museum’, in: R.C. Bridges & P.E.H. Hair (eds) Compassing the Vaste Globe of the Earth: studies in the history of the Hakluyt Society 1846-1996 (Second Series No. 183). London: Hakluyt Society, pp.81-140. 1998. [unsigned] ‘What’s what in the history of cartography’, in: M.A. Lowenthal (ed.) Who’s Who in the History of Cartography: the international guide to the subject (D9). Tring: Map Collector Publications, pp.7-27. * 1999. Searching 'The British Library Map Catalogue on CD-ROM' . Reading: Primary Source Media. * 1999. ‘What does the "digital future" really mean for map libraries?’, in David Fairbairn (ed.) Proceedings of the British Cartographic Society 36th Annual Symposium and Map Curators’ Group Workshop, Glasgow, 1999, pp.2-9. [Also in Cartographiti: the newsletter of the Map Curators’ Group of The British Cartographic Society (Sept. 1999) No. 59, pp.5-11]. * 2000. Where are map libraries heading? Some route maps for the digital future’, Liber Quarterly 10, pp. 489-98. * 2002. 'My favourite map', Cartographiti, the newsletter of the Map Curators' Group of the British Cartographic Society, 65 (Sept/Dec. 2001 [i.e. June 2002]), pp. 13-17 [on the Cassini map of the moon, 1679]. 2004. ‘Helen Margaret Wallis’, entry for The Oxford Dictionary of National Biography [available free online to UK public library subscribers]. 2005. 'Issues arising out of the Forbes Smiley affair'. ** 2006- . Martin Llewellyn's Atlas of the East (c. 1598) [a revised and expanded version of the 1975 conference paper, to which material continues to be added]. A version of this webpage, as it was in mid-2009, was placed on the Kunstpedia site. * 2012. 'Why were medieval sea charts still being produced four centuries later? Does the answer lie in the Aegean? ', text and podcast of the paper given to the international conference, "Cyprus on the crossroads of travellers and map-makers from the 15th to 20th century", organized by the Sylvia Ioannou Foundation, Athens, 18-20 October 2012, at the Museum of Cycladic Art. ** 2013. Why the artificial shapes for the smaller islands on the portolan charts (1330-1600) help to clarify their navigational use, Cartes et géomatique, 216 (June 2013): 47-65 (paper delivered at the international conference, 'D'une technique à une culture: les cartes marines du XIIIe au XVIIIe siècle', Paris 3 December 2012). *** 2015. A detailed reassessment of the Carte Pisane: a late and inferior copy, or the lone survivor from the portolan charts' formative period? (An extended essay on the dating of the Carte Pisane, concluding in favour of a date of c.1290 and reassessing what the Carte Pisane can tell us about the early stages of portolan chart development - supported by a range of tables). ** 2015. Listing and analysis of portolan chart toponyms along the continuous coastline from Dunkirk to Mogador (early 14th to late 17th century) including the transcribed names from the 'Liber de existencia riveriarum' and 'Lo compasso de navegare' as well as the Carte Pisane and Cortona chart (a much expanded and revised version of the 2013 Excel spreadsheet). 2015. 'Imago Mundi' (p.636), and 'R.V. Tooley' (p.1535), in: Mark Monmonier (ed.) The History of Cartography. Volume 6. Cartography in the Twentieth Century (University of Chicago Press, 2015). Indexes to The Map Collector issues 1-30 [with Tessa Campbell]. Reviews, newspaper articles, obituaries &c. (e.g. of Helen Wallis, inter alia, in Imago Mundi 47 (1995) 185-8). [Available online via JSTOR subscription (in the 'Arts & Sciences Complement')].